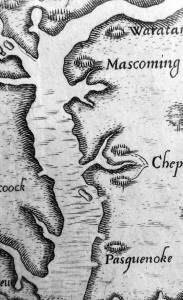 On 24 Sept. 1660 [Nathaniel Batts] purchased from Kiscutanewh, king of the Yeopim Indians, all the land on the west bank of the Pasquotank River from its mouth to the head of New Begin Creek. 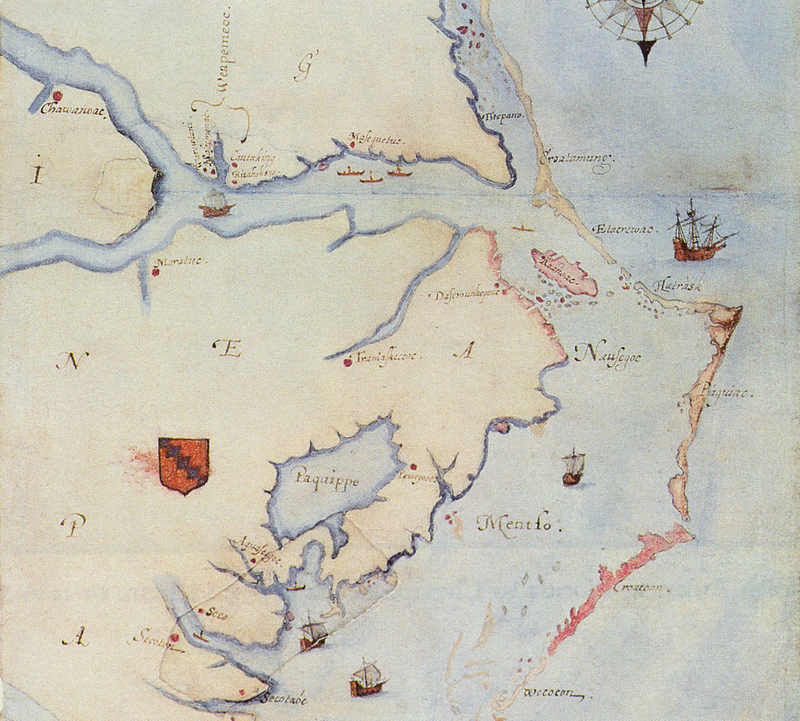 This transaction, which survives in the records of Lower Norfolk County, Va., is the oldest known surviving North Carolina land deed… His best-known holding was Heriots Island at the mouth of Yeopim River in the Albemarle Sound, which by 1672 was called Batts Island and by the 1690s, Batts Grave. 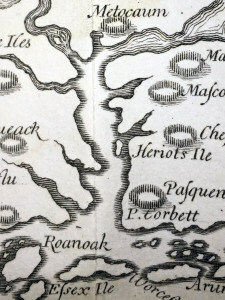 However, published abstracts of wills from 1727 (witnessed by Moseley) and 1747 refer to “Batt’s Grove”. 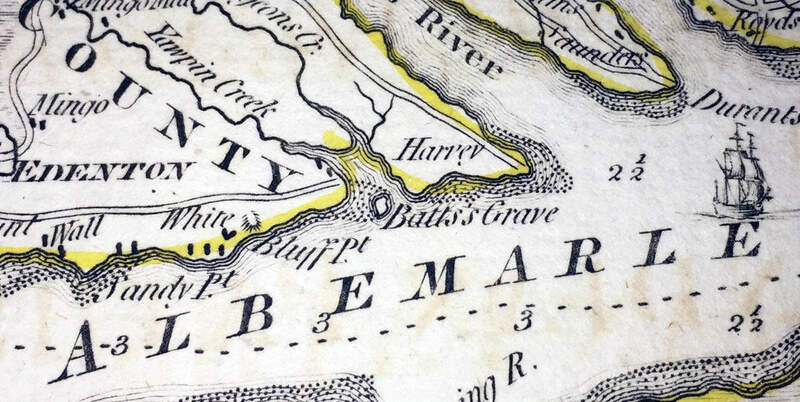 Is “Grave” an engraver’s error? Or, is “Grove” a transcription error? 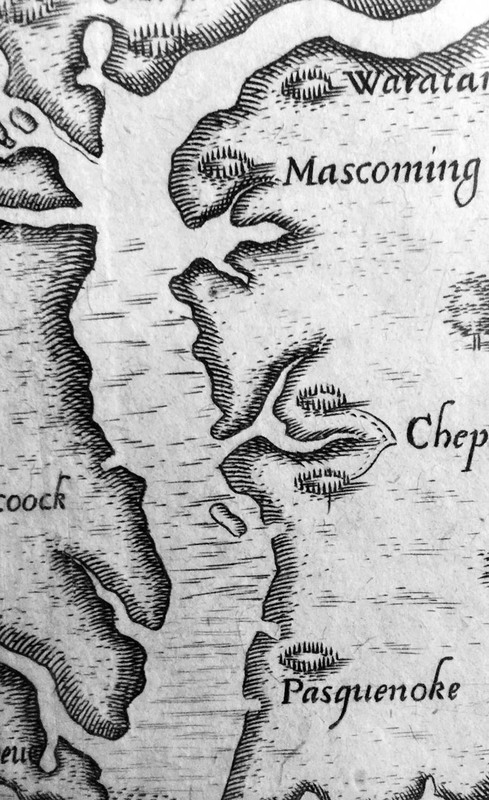 Belle Long (see comments) has confirmed that it is a transcription error. Nicholas Crisp’s 1727 will clearly indicates “Batt’s Grave”, as does a 1747 will of John Hull. 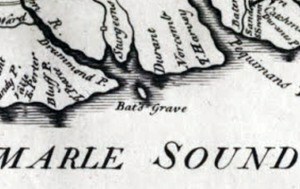 The name is engraved as “Batfs Grave” on the 1770 Churton-Collet map (below, left), and as “Batts’s Grave” on the 1775 De la Rochette map, aka Mouzon map (below, right). 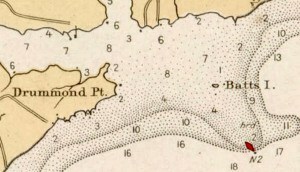 According to the North Carolina Gazetteer, in 1749 the island “was 40 acres in area and had houses and orchards on it; by 1756 it had been reduced to 27 acres.” The island remained stable on coastal surveys published between 1860 and 1913. However, the forces that shrunk it in the 18th and early 19th centuries returned with vigor in the 20th century. 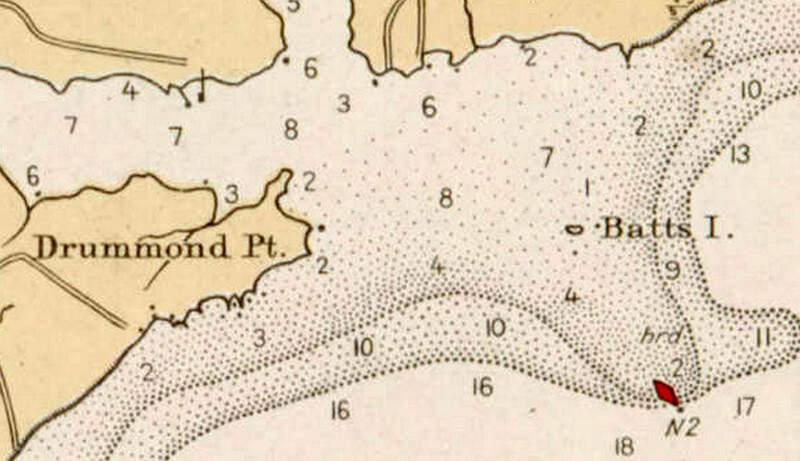 By 1919 (below) and 1940, only a “speck” of an island remained, and then it was gone. 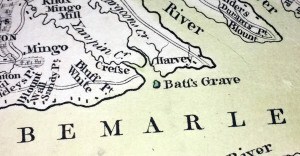 So, where is Batts’s grave? 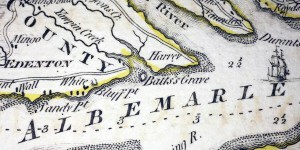 If one believes he was buried on Heriot’s Ile, then Nathaniel Batts, not to mention the entire island, is now buried at sea. 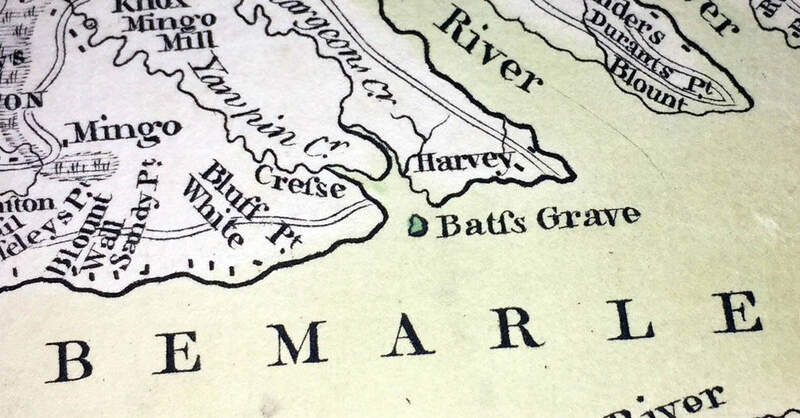 Murder, Surveyor’s Ferry, and now Batts’s Grave. That completes our Albemarle region trifecta. We’ll head elsewhere next time. 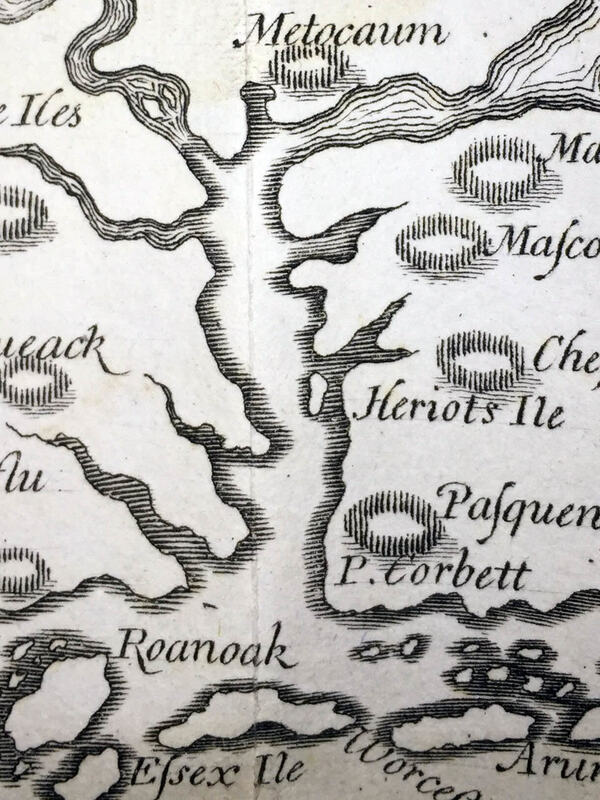 This entry was posted in 16 & 17th Century, 18th Century, 20th Century and beyond and tagged batts grave, batts's island, heriot's ile, nathaniel batts by crmaps. Bookmark the permalink.